I’m lucky enough to be a “handy-man”. One of the first things I did when Yoda arrived in our home was to create a very special cat litter box furniture. Little did I know that other options were already available online! 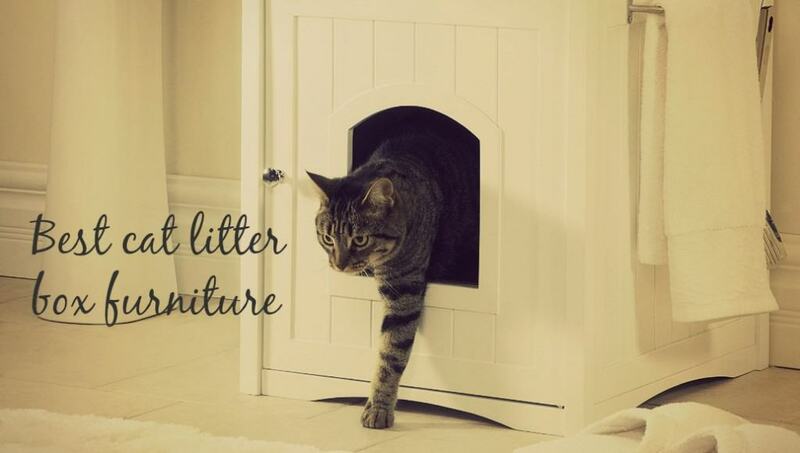 You can really find what you want out there: cat litter box furniture that’s big or small, original or simple. What is clear is that there is what you need to hide this ugly litter box and make a comfy space for your cat. Check out our reviews! Why Buy Into Cat Litter Box Furniture? 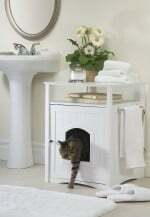 Why Buy Cat Litter Box Furniture? There are a dozen reasons why investing in cat litter box furniture is useful and beneficial. See! That’s 12 reasons already! Merry Products Bench $$$ 21.2 x 37.5 x 22.5"
Merry Products Night stand $$ 18.5 x 16.5 x 18.5"
Pet Studio/Meow Town Cabinet $$$ 28 x 24 x 19"
New Age Pet End table $$ 23.8 x 17.5 x 22"
Below you’ll find more information for the products in the table above. If you have any follow-up questions regarding one of our reviews, just let us know! 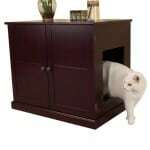 The Good Pet Stuff Hidden Litter Box is one of the most affordable cat litter box furniture you can find that has such a cool design. It does the job of hiding the litter box and provides enough space for your cat to do his thing. 🙂 The material is really strong (polypropylene) and easy to clean. The litter box furniture doesn’t look too “plastic-y” as it actually imitates clay. The potted plant style makes it very convenient to integrate into your home decor! 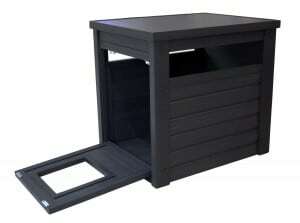 What’s more, this litter box furniture is a reliable product that you will be able to use for a very long time. It has been tested by demanding customers/cat lovers who used it for several years and were fully satisfied with its design, durability and odor control. You will find great reviews by customers, so do not hesitate to check it out and make your own opinion. Why we like it: Fun design, strong, suitable for multiple large cats, easy to clean, affordable, no odor. What could be improved: Not much really. Even if you are not an adept of fake plants like us, it really makes a difference compared to the ugly plastic box. Maybe we’ll work on our own new product for you guys! A very flexible product that fits any type of litter box. 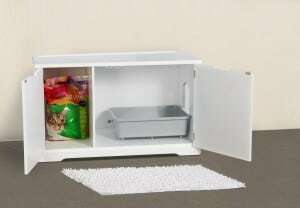 You can fit a big automatic litter box or a smaller box and the litter itself or even other accessories. The removable partition makes it super flexible and creates so much space that you can fit almost anything that is related to your cat( scooper, litter, toys…). It also remarkably traps the odors inside. What is also very convenient is that you can set the entrance right or left depending on your needs and the room configuration. Now for the visual part, the design is simple and efficient which basically makes it super easy to integrate into any room. You can add plants or flowers on top or basically anything you want. Why we like it: Very flexible, spacious, good design. What could be improved: It is not waterproof (so if your cat misses a lot, it’s better to get a covered litter box (it fits in there so no worries). They call it a bench but you cannot really sit on it, it’s more about the visual aspect. You can use this item in many different ways: as a coffee table, a nightstand, you can even integrate it easily into your bathroom. The look is really great and integrates perfectly in most houses/apartments. To keep it looking nice, we recommend using a high wall / covered litter box. In addition to that, lots of customers used shelf liner at the bottom to prevent any damage that your cat could cause if he misses. It’s a shame but this is not waterproof. You just need to keep that in mind and your unit will be just fine. It fits smaller litter boxes (18.5 x 16″) than the bench so you need to make sure you have the right size! 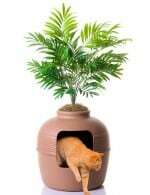 We recommend this item mostly for smaller cats because you want your cat to have enough space to feel comfortable and to actually use it. We insist that you check the dimensions. Just check out customers pictures posted on Amazon and you will see how it looks in context. 🙂 Lots of customers think it’s smaller than it looks. Other than that, it does the job of hiding the ugly litter box and it is pretty easy to assemble. It has a towel rack on either side (you choose where you want it) that’s really convenient. As for the odors, there is really no problem if you clean it regularly! Why we like it: Neat design, one of the best options to integrate into your home decor. What could be improved: Same as it’s big brother, not waterproof. Could be a bit bigger, so opt for the jumbo size. A very classy solution to hide the litter box! 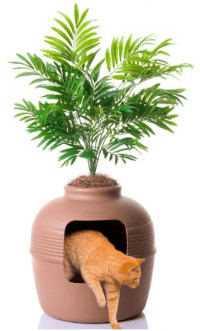 This one as plenty of space both for your cat and for his/her accessories. The extra drawer is convenient as you can use it for all your cat accessories. The mahogany color is very nice and makes it easy to integrate into your house. However, like it’s competitors from Merry Pet, this furniture is not waterproof and highly fragile to cat pee. Luckily, advised customers found a way to prevent this from happening by using a high wall / covered litter box. 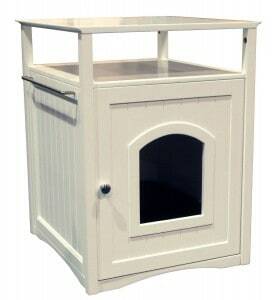 Why we like it: Classy design, double doors for easy access and a cute drawer to store your cat’s toys. What could be improved: Waterproofing or adding a plastic invisible liner on the bottom would help clear up litter spills. If we prefer the Merry pet washroom for its design, this one is of better quality. The design is simpler but still attractive and most importantly, efficient. It also gives your cat more space inside than its competitors. The ecoFlex litter box is made from recyclable materials and reclaimed wood. We love it for its green thumb! 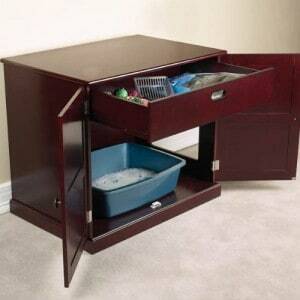 Unlike with the other cat litter box furniture, you do not need to be careful about the box soaking up moisture. If your cat misses a little, just wipe clean. As for the other furniture in this category, make sure to use a high wall litter box and we would even cover the bottom with liner, just to make sure. Overall, the material is better quality than it’s competitors. It is ecoflex, eco-friendly and is made up of a durable composite material. It’s also easy to assemble! What could be improved: A double door access would more easily allow to place this furniture in any room design. For additional options, check out the Out of Sight Litter Box by our friend Paul. His product is made in the USA with top quality materials. This litter cabinet hides the litter pan, like all others but it also prevents litter tracking by having the litter box up on a second shelf, so when the cat hops down, the paws open naturally and the litter falls out. This litter box ships out knock-down-flat (KDF), and assembly is easy with step-by-step photo instructions. See his website for more details! 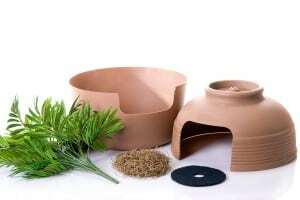 We do believe that this selection of 5 items is part of the best cat litter box furniture you can find out there. They all perfectly hide the ugly plastic litter box while giving your feline space to poop in peace. Depending on what you need, the space you have, you can pick what’s best. Stay in touch for updates on our top 5 by following us on Twitter, Facebook, Instagram, etc! We hope you can find what you were looking for! We thank you for your trust and for reading Fluffy Kitty and hope to see you soon! Next Post Cat Tail Language: What Is Kitty Trying to “Tail” You? We found your blog on google! We wonder if you would like to review our products? Hi Grace, thanks for reaching out 🙂 If you’d like to contact us to tell us more about your products : contactfluffykitty@gmail.com. We would love for you to add our product to your list. Feel free to contact me if you need more info. Oh and check us out.